White china beaker, gold rimmed, and adorned with transfer decoration. Front design: a globe topped by the Dove of Peace and flanked by the national flags of Britain, USA, Italy and France with a victor's laurel wreath below. To the left of the American and French flags '1914'; and to the right of the Italian and British flags '1919'. A scroll marked 'PEACE' runs across the globe and the date '28th JUNE 1919' across the laurel wreath, with the inscription 'THE GREAT WORLD WAR' curved beneath. Reverse design: a dove and scales within belt, topped by motto 'PEACE AND JUSTICE'. 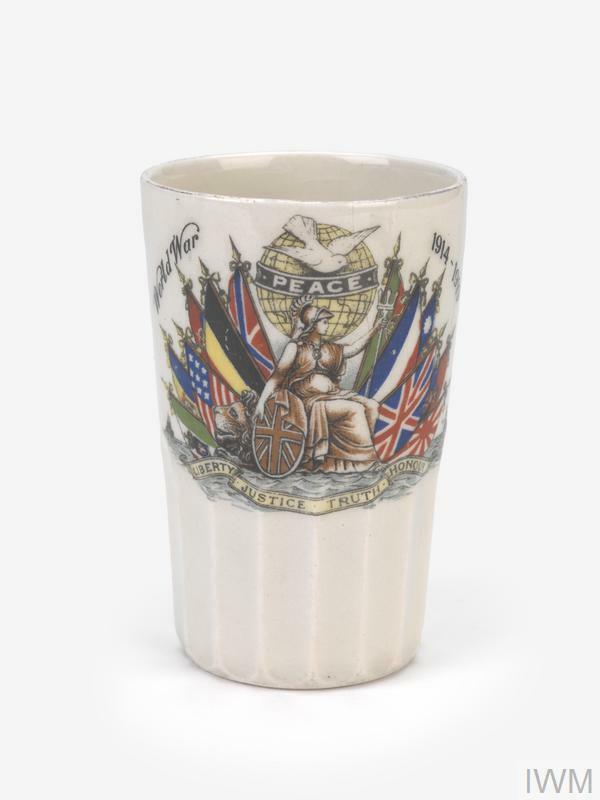 Commercially produced white-bodied earthenware beaker (with coloured transfer decoration) commemorating the signing of the Treaty of Versailles on 28 June 1919, which formally ended the war against Germany. The beaker was formerly the porperty of Percy Emerson Petch (1882 - 1957) of Hull; it was then passed to his grandson, Colin Stubley (1946 - 2011), also of Hull, and then to the donor, John Francis Haines. 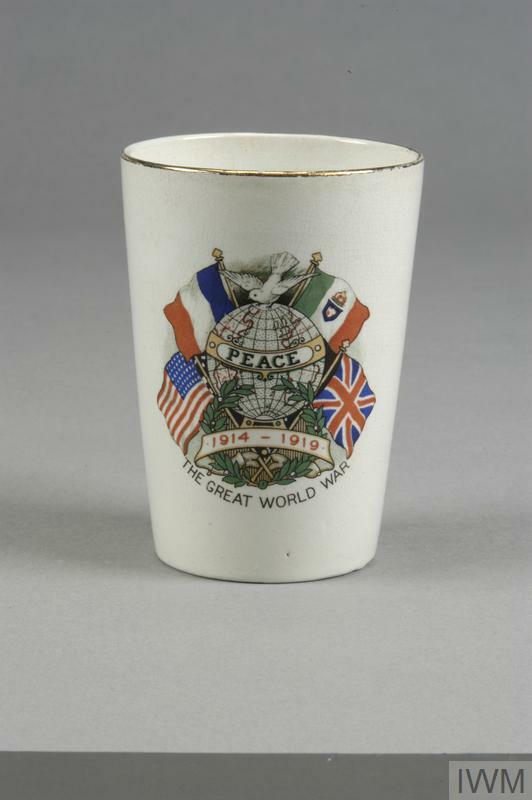 The beaker was donated to the Imperial War Museum in acknowledgement and memory of Mr Haines' deceased relatives.